Business success is determined by one key concept. When you understand and use it, you will be able to face and overcome challenges and continually improve, in both your business and personal life. This simple concept is called above and below the line. Picture an imaginary horizontal line. 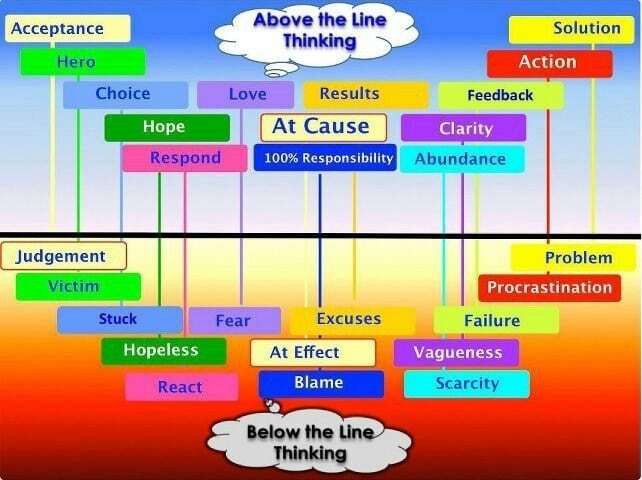 Above the line is a way of living in which you take ownership, accountability and responsibility for everything in your life. In business this may be the amount of money in your bank account, the type of clients you are working with, or the quality of your relationships. Up here you’ll find solutions and results. You’ll have the mentality of a successful victor over your circumstances. Living below the line is using blame, excuses and denial to avoid responsibility for improving your life. Here you play the victim, come up with reasons you don’t have what you want, and focus on problems. It’s human nature to go below the line daily. Science shows that we have a negativity bias – an inbuilt protection mechanism to look for threats and weaknesses over opportunities, to ensure our survival. The challenge arises when we live below the line on a regular or permanent basis. There are many things we can’t control in life. To live above the line, we must focus only on what we can control and influence. We can’t control Australia’s economy, but we can choose our financial decisions on a daily basis. We can’t determine which political party will get into office, but we can have our say by voting and contributing positively to politicial discussion. No matter what life throws at us, we can always choose our thoughts, attitudes and behaviour. It’s important that we don’t ignore problems and challenges, as they don’t usually go away on their own. Dealing with them when they first appear is key. It’s also vital to deal with stress by venting when needed. If we find it hard to be above the line in our office, we give each other a 3-minute time limit. We have fun and blame everyone, make every possible excuse, and deny any responsibility for our situation! Then we ask, “now what’s the outcome we want, and what are we going to do to get it?”. How do you live above the line to ensure business success? When things are not how you want them to be, focus on the solution, not the problem. We all have challenges in life. Leadership and personal development expert Brian Tracy describes business as: Problem – problem – problem – problem – CRISIS! Imagine business challenges as waves on the ocean (which means every seventh one is likely to be a dumper…). You can choose to get out of the water, or learn to surf. The secret to life and business success is to focus on solutions rather than problems. 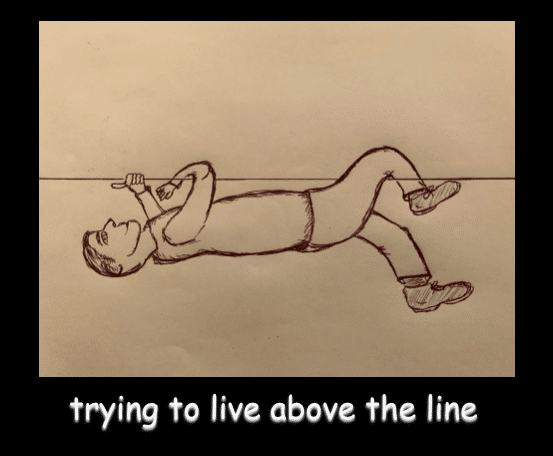 Are you living above the line? If you’d like to achieve greater success in your business, whether it be more money, a stronger team, or greater freedom – contact Yellow Coaching to see if you’re eligible for a complimentary 90 minute consultation on your business. We work with businesses and organisations throughout Australia. We look forward to hearing from you.